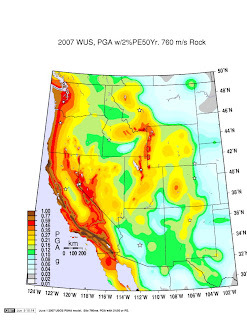 The USGS has prepared updated draft versions of the national seismic hazard model and maps, intended only for public review and comment during June and July 2007, not for use. 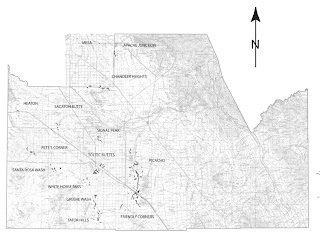 Please review the maps and documentation and send your comments and concerns to NSHM07@usgs.gov. Arizona has a new Renewable Portfolio Standard (RPS) of 15% which means the state's regulated utilities have to get 15% of their electric generation from renewable energy resources. This is up from the old requirement of 1.1%. Another change is that geothermal energy is included now in the mix. We should expect Arizona utilities to explore for high temperature geothermal resources that might support electric generation. We might also expect them to promote use of moderate and low temperature resources for space heating, green houses, etc. This use of distributed energy production, by consumers, can count towards the utilities 15% obligation. The Arizona Corporation Commission approved the larger RPS earlier this year, but implementation was waiting for an opinion by Arizona Attorney General Terry Goddard. That approval came last week. George Davis let the UA virtual reality lab use rocks from his personal collection to demonstrate their capabilities. Move them around in 3-D at http://qtvr.arizona.edu/work/rocks.html. George is a professor of geology at UA and recently stepped down as Provost to get back to teaching and research. 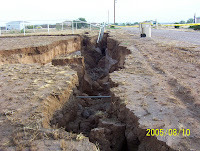 But further reading disclosed that the rise is for a small part of the aquifer under central Tucson. According to a quote from Tucson Water spokesman Mitch Basefsky, the area where the level is still falling is larger than where it's rising. In other words, the aquifer water level overall is still dropping. How many readers of the newspaper came away understanding that? My guess is not many. The lawsuit that many scientists believed would prohibit anyone but licensed surveyors and engineers from making a map (see my May 14 blog), was dismissed by the judge today in summary judgement. The judgement said "Nothing in the legislative history of the 1988 amendment suggests that the phrase 'surveying and mapping' was intended to broaden the Brooks Act’s focus from construction on federal lands to the procurement of mapping services unrelated to construction on real property." Is brackish water the coming groundwater resource? Could today's brackish groundwater resources be the fresh water resources of tomorrow? If so, we have to be concerned about the geologic sequestration of CO2 (carbon dioxide) into saline or brackish aquifers. That's the message here at the state geologists annual meeting from Kevin McCray, Executive Director of the 14,5000 member National Ground Water Association. Kevin noted that 40,000 communities and 15 million households get water from groundwater resources. The growing pressures on ground water are coming from population increase, demands for biofuels, and climate change. The American Geological Institute's "Image Bank" has over 6,600 geology images online (http://www.earthscienceworld.org/images/) that can be searched by subject and freely downloaded for use in talks and presentations. There are outstanding Arizona images in the bank, including the one shown here. AGI's new Executive Director, Pat Leahy, briefed us at the State Geologist's annual meeting, on this and the upcoming geology documentary that will be shown on the Discovery Channel this fall. The Republic says ASU is the first university in the country to start a School of Sustainability. The Phoenix PBS affiliate, KAET-TV, Channel 8, devoted half of last Wednesday night's edition of the "Horizon" program to earth fissures in Arizona. It can viewed in Windows Media Viewer or Quicktime, or listened to as a podcast at http://www.azpbs.org/horizon/watch.asp. Scroll down to May 30 and click on the earth fissures link. Professor Karl Flessa is taking over as chair of the UA Geosciences Dept, one of the best in the nation (US News & World Report ranks them 8th in Earth Science, 7th in Geology, 12th in Geophysics, and 16th in Geochemistry). Susan Beck is stepping down after an extremely productive seven years as chair. I was on the external review panel for the department's Academic Program Review, an evaluation that occurs every seven years. The panel described the Geosciences Dept as one of the university's greatest assets and encouraged additional strategic investment in the program. 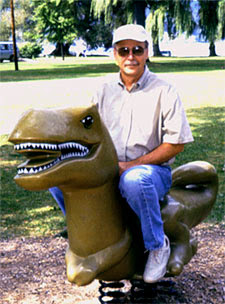 He describes himself as a collector of "roadside dinosaurs." You can find the planning maps in pdf format online at the AZGS home page (www.azgs.az.gov) or go directly to www.azgs.az.gov/earth_fissures_planning_maps.html. Paper copies are available at the AZGS bookstore at 416 W. Congress in Tucson, or from the AZ Dept of Mines & Mineral Resources giftshop at 1502 W. Washington in Phoenix. They are $4 each. We are continuing to add materials and links to the web page. Suggestions are welcome. The first area to be mapped in detail, Chandler Heights, is expected to be completed this month. These high resolution data will be displayed online in an interactive GIS format, at 1:24,000 scale by Arizona State Land Department within 90 days of receiving the data from AZGS. for more than a decade."